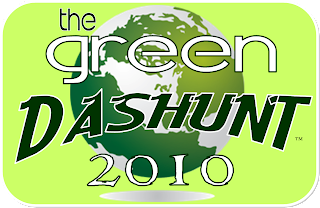 We are in the process of designing a completely "Green Game" for 2010. The game will be as "Green" as possible using recycled materials for our game packets , shirts, bags, papers, props, you name it. The other aspect of the game will be that the 2 hr game will have more of an enviromental theme on most aspects of the game while still holding true to our Cashunt foundation of 6 games in one. The other great aspect is that with each game a percentage will be going to an Massachusetts Enviromental / Green Non Profit Organization. We are going to be to be doing our research on which organization would work best, if there are any suggestions please feel free. This will official kick off our "Color Dashunts" which will also include our "Pink Dashunt" for Breast Cancer. More information when it's set for release.